Bike Week 2018, which aims to raise awareness of cycling, runs from 9th – 17th June 2018. What better time to give e-biking a try – biking without the effort sounds good to me! When I was working the winter season with Inghams in Saalbach I heard about the growing popularity of e-biking in Austria from fellow representatives who also work summer seasons in the mountains. Our training was at the Chalet Linda in Kitzbühel Austria and this area has already become a big centre for e-biking thanks to the stunning landscapes with beautiful but steep mountains. So, I was happy to go along when invited by Inghams to try e-biking in the UK. 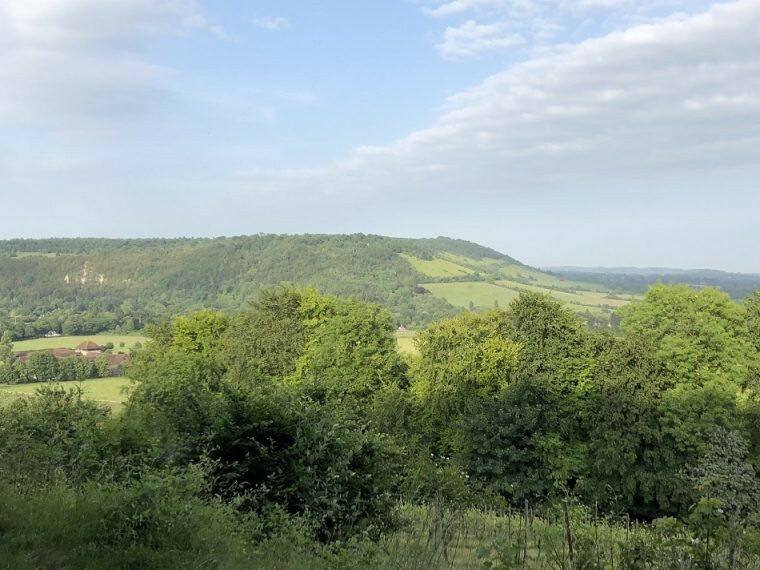 The meeting place was Denbies Wine Estate near Dorking, Surrey perfectly situated for the climb up Box Hill, made famous by the Olympic Bike race and now one of the highlights of the annual Prudential Ride London Bike race. 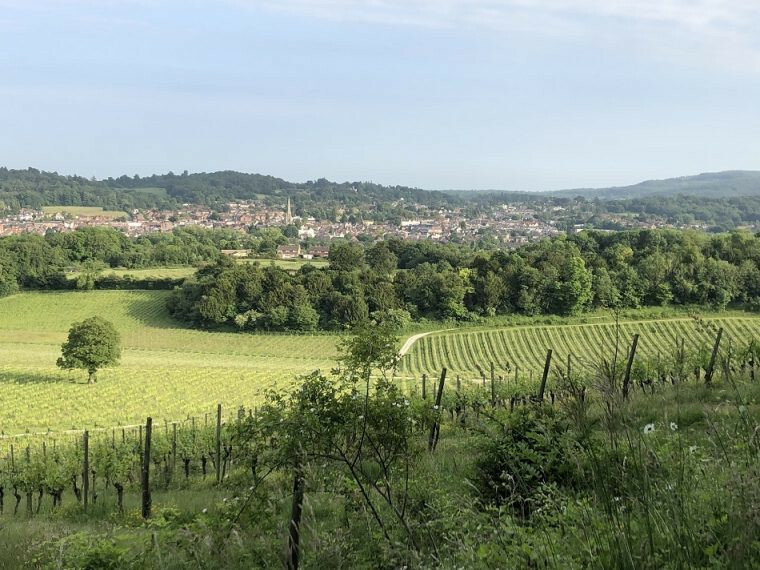 It was a beautiful sunny afternoon when we arrived at Denbies Wine Estate. The e-bikes, electric assisted bikes, were waiting for us, supplied by Focus, a leading manufacturer of these modern miracles. We were fitted with our bikes and helmets, given instructions on how to use the e function and we were all set to go. The majority of the group headed off to climb Box Hill, a steep hill I have walked up in the past. Others stayed in the grounds of the vineyard which stretches out in all directions, giving ample opportunity to test the e-bikes. I am recovering from an Achilles Tendon injury so, although the e-bike does take most of the work out of cycling, I decided to stay within the boundaries of the vineyard. I was a bit tentative as I hadn’t been on a bike for a few years. After a couple of gentle circuits around the Denbies centre I ventured up a smaller, but still steep, hill to see how the e-bike performed. It was a real revelation, as I was pedalling up the hill I moved from eco into trail mode then boost mode on my bike, suddenly although I was still pedalling it was very easy. I reached the top of the hill with no problem, I did stop on the way up to take in the spectacular view but on setting off the boost function kicked in again to help me. Fabulous! it really is cycling without the blood, sweat and tears. I didn’t know exactly what an e-bike was before the ride; it turns out that the frame is slightly bigger as it houses a motor, you still need to pedal but it takes the effort out of climbing up hills, it’s not a totally electric means of transport. It’s a very cheap form of transport as you can charge the bike using a normal socket. I spent a few moments enjoying the stunning view from the top of the hill then I made my way back to join the group who had done the longer route. 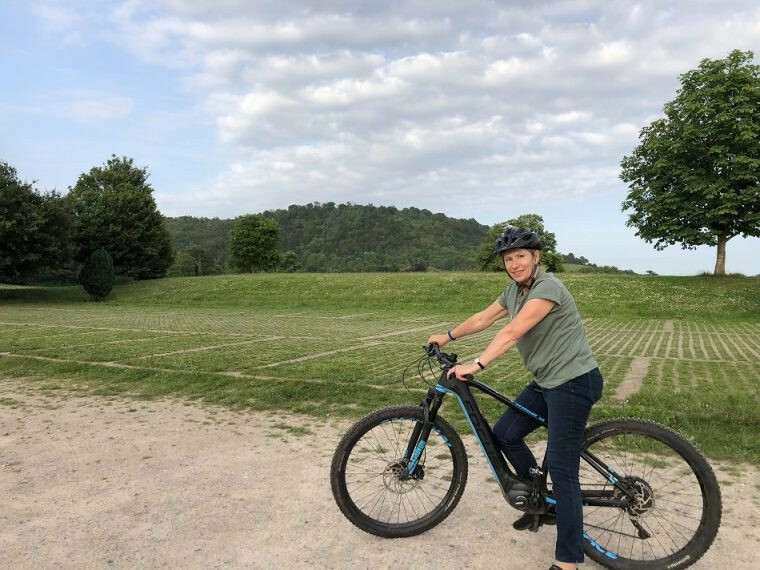 I was definitely impressed with the bike and could see how much fun it would be to own one or hire one in a country with steeper terrain enabling you to get to places you would not normally be able to without a lot of difficult cycling. Then we had a short presentation from Ray Wookey, founder of Cycling Made Easy an e-bike retailer. He’d been the guide for those who tried the ascent to Box Hill and is an expert in E-biking. Whilst sales of traditional bikes have plateaued in the UK e-bike sales have risen dramatically over the last few years. 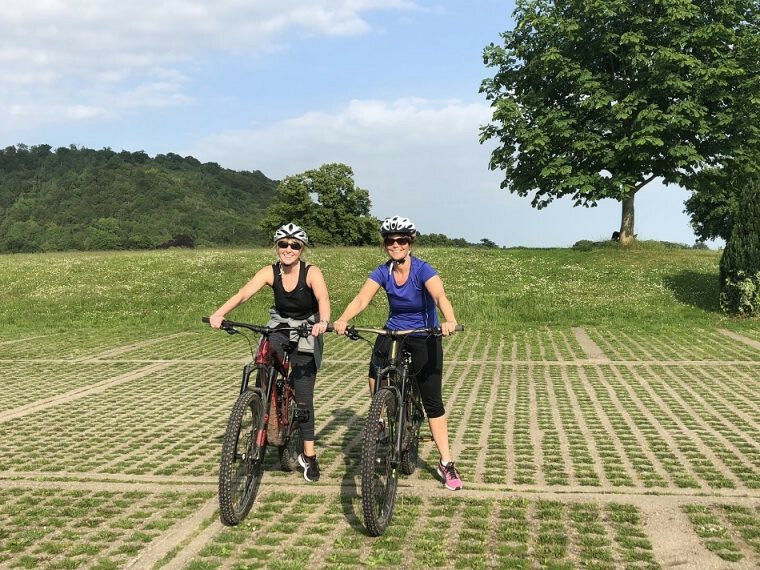 They are easy to use, very handy for cycling up hills and give people who would otherwise not cycle the opportunity to do so – perfect for groups of cyclists of differing abilities. 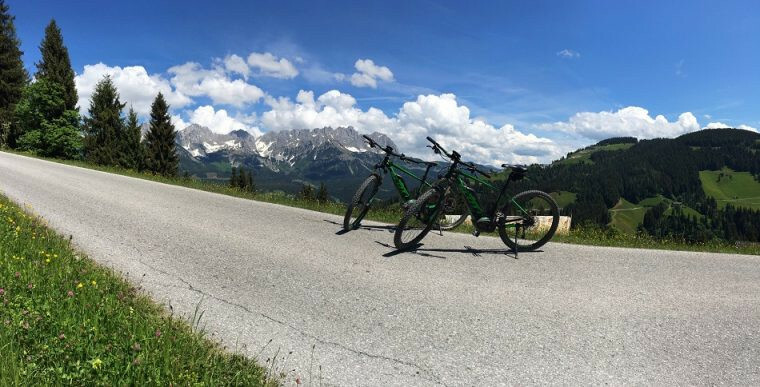 This summer Inghams is offering a new bespoke guided e-biking programme for guests staying at the Chalet Linda in Kitzbühel. The surrounding area is one of the world’s biggest e-biking regions with one thousand kilometres of trails giving access to breathtaking mountain scenery. A seven-night stay on a catered basis (including buffet breakfasts, packed lunches, afternoon tea and cake, and four-course evening meals with complimentary wine for six days) at the three-diamond Chalet Linda in Kitzbühel, Austria with Inghams costs from £599 per person based on two sharing in July 2018. Price includes return flights and airport transfers. Inghams’ new guided e-biking programme included five rides per week and is available exclusively for guests staying in Chalet Linda. It can be booked in resort via the Inghams Representative and prices start from €39 per person per ride. For more information, visit https://www.inghams.co.uk/lakes-mountains-holidays or call 01483 791 116. Bike Week, delivered by Cycling UK and supported in Scotland by Cycling Scotland, is an annual opportunity to promote cycling and show how cycling can easily be part of everyday life. 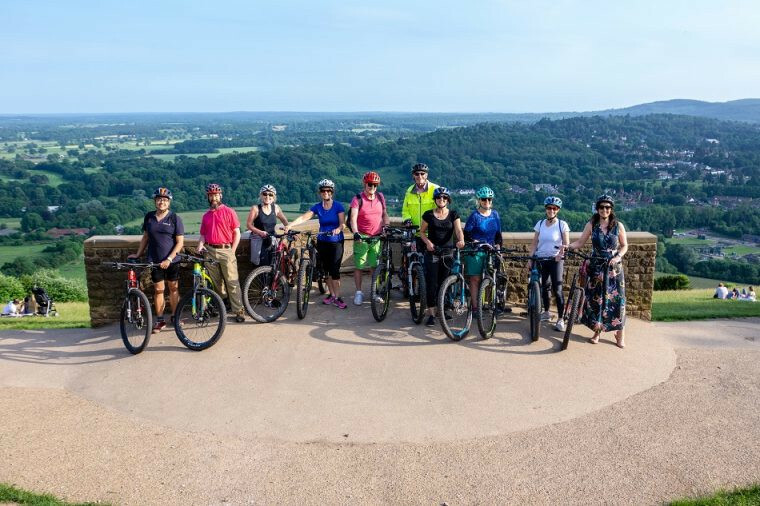 Bike Week 2018 runs from Saturday 9 June until Sunday 17 June with many events and activities taking place right across the UK; it supports over half a million people to rediscover cycling and rethink everyday journeys, using cycling as a convenient way to get around. For more information, visit www.bikeweek.org.uk.